A light, flavorful beef stew cooked with carrots, onions, potatoes, tomatoes, garlic, bell peppers, turnips and cabbage, and seasoned with cumin, bay leaves, and freshly chopped cilantro and dill. Delicate handmade dumplings (both fried and boiled) filled with a mixture of ground beef and onion and served with sour cream. A sweet and tangy cooked salad made with eggplant, onion, carrots, grated tomatoes and freshly chopped dill and cilantro. A bright salad of diced cucumbers and diced boiled potatoes mixed with garlic, oil, and fresh dill. A classic Uzbek salad of thinly sliced tomatoes and red onion with a dash of cayenne. I loved my first experience with League of Kitchens and cannot wait to tell everyone I know. 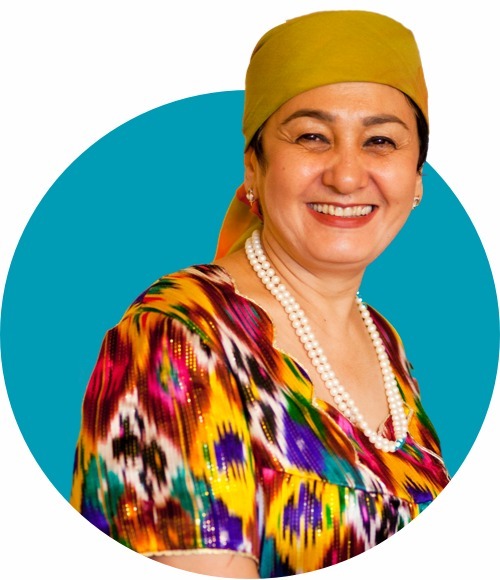 I really enjoyed the small class and how personal Damira was--she really opened herself up, speaking about Uzbek culture, offering her own childhood stories growing up in Uzbekistan. I love that the focus is not just about food-- what makes this special is the human connection; I loved learning more about Damira, her family, and life in Uzbekistan.